While keeping your body fit, Make sure that your eyes stay healthy too! I sometimes refer to myself as cyclops and that's basically because I only have one functioning eye. God has blessed me to be able to see based on how weak my eyesight is.I will do everything to help keep them as healthy as possible. I am getting to that age where I will have to worry about other things that will be affecting the health of my eyes and I want to learn and also share with y'all how to keep your eye health optimum. Let's learn more about a common curable eye disease, AMD. 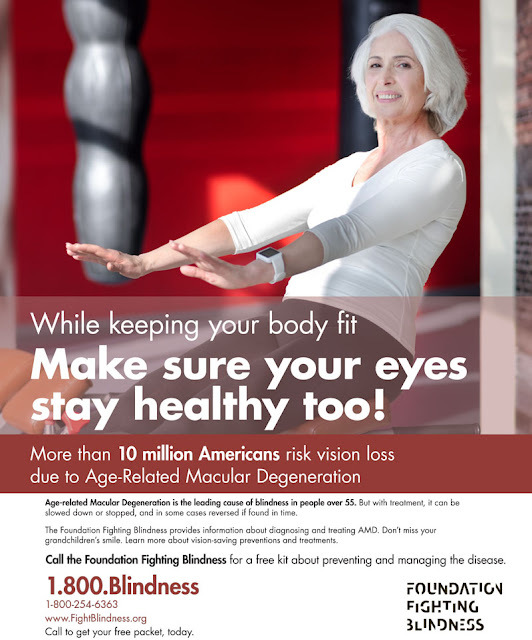 Every year nearly 10 million Americans go blind due to AMD or Age-related Macular Degeneration. The exciting news is that a cure is in sight! The Foundation Fighting Blindness, a non-profit organization, has provided funding for research on cures for blindness, specifically AMD, since 1971. In fact, with the research FFB has already made possible, treatments to stop and in some cases even reverse retinal disease is a reality. This is great news for people over 55 and their families. With AMD it is nearly impossible for grandparents to enjoy the little things in life such as playing games, watching movies and reading to their grandchildren. However, due to innovative research, those things are once again possible for many people…but, we need to continue this outreach, support additional research and find cures. Please remember while everything is pointing to keep our bodies fit and healthy, we cannot forego the health of our eyes! There is just too much of God's beautiful life to see! AMD is an eye disease that causes the loss of central vision. Specifically, AMD causes degeneration of light-sensitive cells in the macula, the central portion of the retina which enables us to perceive fine visual detail. The macula helps us with activities such as reading, driving and threading a needle. You can see the Table Of Contents of what the booklet will contain. There is much information which is helpful and can be life-changing. Does Macular Degeneration Lead to Total Blindness? How Can I Prevent Losing My Vision to AMD? Are There Treatments Available for AMD? If I Have Drusen Deposits, Does That Mean That I Have AMD? Are Cataracts Associated with Macular Degeneration? Can I Donate My Eyes to the Foundation for Research? How Can the Foundation Fighting Blindness Help Me? How is your eye health? Do you know anyone who is affected with AMD? Share a tip on how you take care of your eyes? I recently had cataract surgery on my eyes and know how important eye health is. Good post for all to read. Glad to know that treatments are available. My dad lost an eye due to not getting the treatment soon enough. My daughter is going for PRK surgery for her eyes. She has such bad vision at such a young age of 24. Eyes are the most important and we should all get yearly checkups. I'm you're bringing awareness to this. I'm glad there is treatments available. This is so important to keep in mind! My eyes were pretty bad--I had Lasik to help! It's so good to know there is research in this area and that treatment are available. It's so important to get regular eye exams even if you don't need glasses to check up on the health of your eyes. I think we take our eye health for granted. I know I do. My sister is only 53 and she has glaucoma. She cannot read or drive. It is devastating. This is a timely reminder for us to take care of eyes. I cannot imagine going blind! My vision got worse last year and I had to get a new pair of glasses that would fit me. I will have to set up an appointment with my doctor this week. I've never heard of Age-Related Macular Degeneration. That sounds so scary, I definitely need to get my eyes checked out. My brother in law has macular degeneration. I can't imagine how to cope if I had that. This post is a very good reminder for us to take care of our eyes through regular check ups. This is really interesting! I think unfortunately a lot of people look at eyesight loss as just a part of aging. But like many parts of aging we have the power to do something about it! I am terrible about taking care of my vision. I know I need to go and get new glasses, but I just haven't made the time to do it. Yes! Taking care of our eyes is huge. We go to yearly eye check ups, especially my husband and daughter who wears glasses. Prescriptions are always changing. Great remind because I do not usually take so much attention I should specially because I am long time in front of the computer, for me your post today it was so helpful thank you!